The following list contains digital versions of handouts available to the public at the Information Desk. Information Services provides general assistance to the public, General Assembly members, and legislative staff. Staff regularly provides answers to questions concerning the legislative process, bill status information, legislative representation, committee testimony, and other information relating to the Maryland General Assembly. The Information Services staff is also involved in other activities that assist members, staff, and the public, including the compilation of committee votes, production of the newspaper clipping service, marking of bills heard in committee for later viewing, producing hearing schedules and bill synopses, making recordings of hearings on past legislation, and other matters related to the Maryland General Assembly. 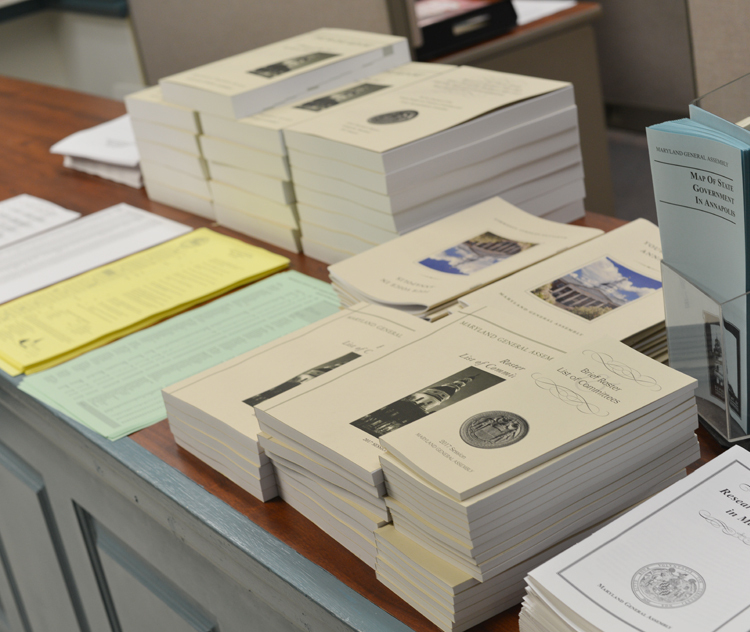 The main Information Desk, housed in the basement of the Legislative Services Building, serves as a distribution center for legislative documents, reports, and other publications and materials of interest to the legislative process. A second Information Desk is open on the ground floor of the State house during the legislative session. Information Services staff also serve as guides for the General Assembly’s educational programming under the direction of the Visitors’ Program Coordinator and prepare information packets for distribution to visitors to the Maryland General Assembly. Tuesday – Friday: 8:00 a.m. to 5:30 p.m. or until the end of session or 10:00 p.m., whichever comes first.